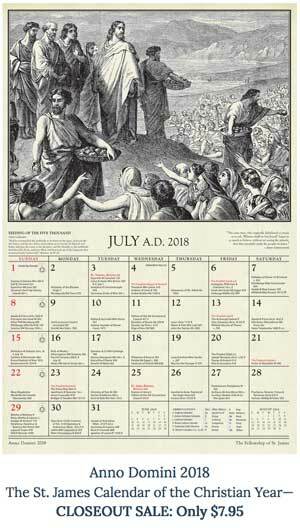 Today the church celebrates St. Luke the Evangelist (see the St. James Calendar of the Christian Year). The artwork here is St. Luke the Evangelist from the Gospel Book of St. Augustine and was discussed in the May/June issue of Touchstone in the A Thousand Words column by Mary Elizabeth Podles. Here are some other articles about St. Luke from the pages of Toucshtone. The Touchstone 2017 Conference—Registration Now Open! As a new feature, Gregory Laughlin, Associate Professor of Law and Law Library Director at the Cumberland School of Law, Samford University, will post from time-to-time writings which relate to the day of the year or of the Church Calendar, along with, where available, links to readings of those writing available on YouTube on elsewhere. This will serve as a sort of literary book of days, or, rather, blog of days, if you will. We’ll be posting some articles for Lent from the archives at touchstonemag.com in the coming weeks. Do check in to see what’s posted. From the upcoming March/April 2017 issue of Touchstone. Readers who were privileged to hear Anthony Esolen speak at Touchstone‘s 30th anniversary conference last October will agree that he is inspiringly passionate about the education of the next generation. This passion is not fueled by resentment over the deliberate rejection of the best of Western culture and civilization, nor by the refusal of our politically correct colleges and universities to properly educate young people in the best traditions of our forebears. Rather, the source of Tony’s passion, I believe, is the sheer joy and wonder experienced in encountering the multifaceted and richly diverse and liberating culture of Christian civilization—including its appreciation of and commentary on the older culture of the Jews, which lies at its root, and the classical Greek and Roman cultures, which richly augment it. He loves teaching Dante because it allows him the privilege of sharing Dante’s resplendent insights into the Divine Love that moves the stars and moves our hearts toward the glory of Christ. Esolen and other purveyors of Christian culture have watched the devotees of a new religion called “diversity” pack the treasures of our cultural heritage into storage boxes and relegate them to the attics and basements of the academy. Access may be permitted for private study—much as Soviet researchers were allowed guarded access to books in Old Church Slavonic or on the lives of the saints—but, say the Diversity Police, such books are not fit for public consumption or for fair presentation in the public marketplace of ideas. Indeed, some might prefer to throw them in the dumpster or just burn them up for good. This suppression is carried out under the banner of “diversity” or “multiculturalism,” which ironically claims that all cultures are equal while it derides Judeo-Christian culture—and will eventually denigrate any other culture that doesn’t support the cookie-cutter diversity agendas of the LGBT lobby. Those who do not affirm gender theory and racial identity politics are homophobic, hateful, “on the wrong side of history,” and therefore expendable. And so, Dr. Esolen, Providence College’s most prolific, popular, widely known, and widely read professor, but one who dared to criticize the lack of true diversity at his college, must be destroyed. Rod Dreher and others have written in detail about the shameful Esolen affair at Providence. Follow Touchstone on Facebook where we post articles almost daily from the vast Touchstone archives. Below is an excerpt from senior editor Allan C. Carlson’s talk “Family Matters: Domestic Altars & Godly Offspring” given on October 15, 2016, at Trinity International University for Touchstone‘s 30th anniversary conference.
. . . the family renewal of the middle decades of the twentieth century is better seen as the consequence, rather than the cause, of religious renewal, a social force resting on doctrinal and institutional integrity. The short answer? It was the failure of the churches. That failure took form in three ways. . . .
. . . The first of these was a broad complacency among religious elites. A healthy family system, and the social benefits that it delivered, was taken for granted. . . .
. . . The second failure of the churches that lay behind family collapse was the open embrace of strident dissent, the encouragement of attacks on the common, orthodox Christian understanding of marriage, sexuality, and family. . . .
. . . The third failure of the churches came as they let down their guard, allowing for a return of the gnostics. Our conference began with Robby George’s talk on this matter. 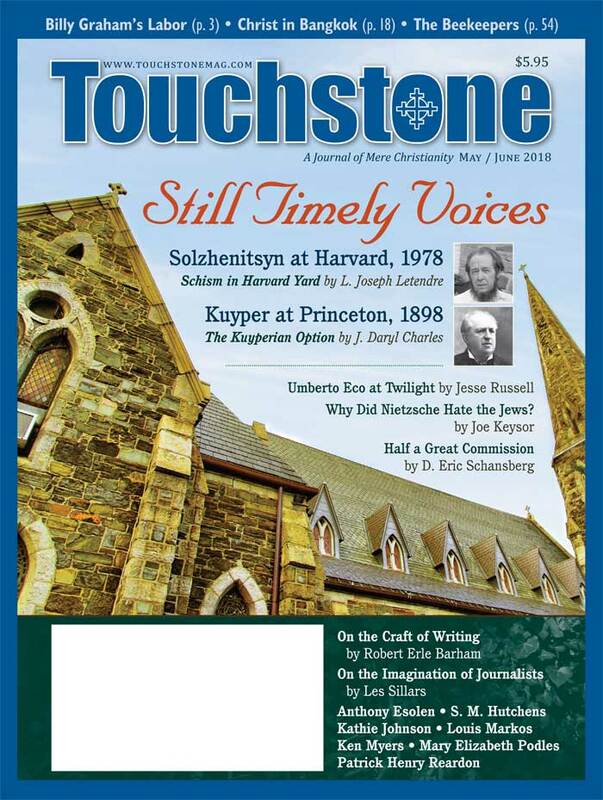 It seems significant that we end on the same question. . . .
We are pleased to be able to share these talks with Touchstone readers in upcoming issues. Dr. Carlson’s is printed in Jan/Feb 2017 and is available to read at touchstonemag.com. You can also LISTEN to his talk—as well as the talks given by Robert P. George, James Hitchcock, Anthony Esolen, David S. Dockery, Thomas S. Buchanan, S. M. Hutchens, Patrick Henry Reardon, and James M. Kushiner—by purchasing access to the conference audio download page.